They say that couples who play together, stay together, but then again, they do tend to just use whatever word conveniently rhymes. 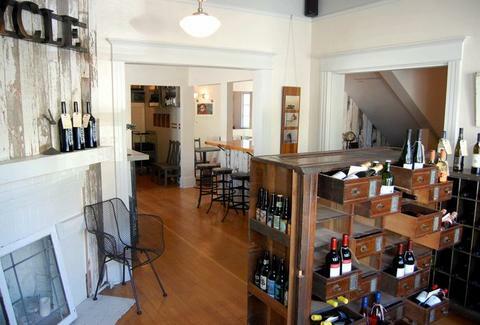 From a couple staying together by opening a wine shop: Bottlehouse. Opened by two lovebirds whose resumes include interior design, event planning, and, naturally, fly-fishing, this new wine bar/shop slings a bevy of local and not-so-local vintages, small bites, and assorted wine-ware from the converted home it shares with Wilridge Winery; the interior features a small bar (salvaged from someone's basement), as well a reclaimed wood dining room decked with rotating local art, while outside there's a sprawling deck and a garden where they'll show movies, which, if you pass out, all end up Sideways. Vino is served by 2oz taste, 5oz glass, or bottle, and ranges from international selections like the Chabiran Bordeaux Superieur from France, to small-lot locals like Willamette Valley's rare NW Vine Project Pinto Noir; they're also doing wine-and-beer-based 'tails like the "Just In" made w/ chinato, prosecco, and orange bitters, who're just mad they lost to Butler in the Elite 8. Pairable grub includes various cured meats (Seatown's legendary Salumi), cheeses (Smokey Blue cow milk from Oregon's Rogue River), and condiments and chutneys like Cerignola olives cured in ash, also a new European treatment for airsickness. Other liquidness includes mostly NW brews by the bottle (Terminal Gravity ESG, Fish Tale Organic IPA), plus two rotating taps from a kegerator fronted by a chalkboard -- perfect for the couple that's playing together, especially if they're 6.